The Story of how our two Under 10 Girls teams came to meet in a cup final – How One Became Two and Two Became One! 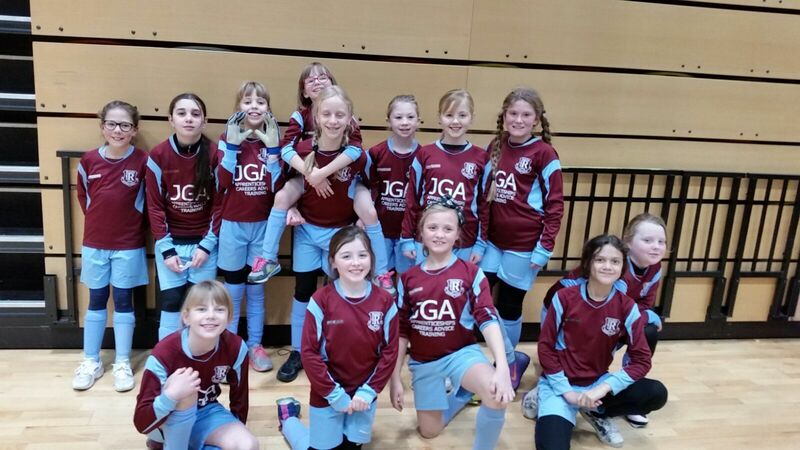 Our two Under 10 Girls teams meet in a cup final this Saturday. This is their story …. Another Saturday morning and another U10 CGL Fixture for Ruislip Rangers. However, this was not like any other. We had spent most of our U9 season, struggling for numbers and trusting the “old” reliables. This season had started with a few new girls, and some of them had started turning up regularly, which was good news for the group. We had 10 players available for this game and I had spent considerable time on the Friday night working out the various permutations in ensuring the 10 players would have equal time in a 5 a side match and trying to maintain some form of balance while making these changes in the match. I went to bed satisfied with what I had decided for the match. However, it was not going to be as easy as that! On the Saturday morning, one of the girls couldn’t make it so I had to re-do the permutations to allow for this. Anyway, to cut a long story short, it was a crazy hour of football! The girls were just settling into the game, forming partnerships, etc and then we would make another change. The play went from being really fluid to completely haphazard and back to fluid, and these phases carried on throughout the game. We lost 9-5, but this didn’t matter. What mattered was that my head was fit to burst trying to make the changes as planned, with 4 subs on my case throughout the hour of match time. The girls didn’t enjoy it like they should have and I certainly didn’t! That was the morning / afternoon that Ruislip Rangers U10 Girls became Ruislip Rangers Clarets and Ruislip Rangers Blues. For the Clarets, it was like a Class Reunion and they bonded all over again and started a run of unbeaten matches that almost made it to the final game of the league season. They were happy as they were all getting more match time and partnerships and understandings were being formed all over the pitch. For the first two rounds of fixtures, the Blues (the “new” girls) were fortunate enough not to play the stronger teams in the division and this helped their confidence massively and allowed them time to develop as a team. The opposition got stronger as the season went on, but the improvement in the new girls was considerable and, suddenly, we had two teams that were winning all of their matches. We had up to 13 girls playing matches and all coming off with a smile on their faces. Parents were delighted as all their kids were playing lots of football and Ruislip Rangers U10 Girls was a happy place to be! It was the morning of the League Cup Festival and the Clarets and Blues were thrown in a hat of 11 Capital Girls League Clubs. This included the Futsal Champions & Unbeaten Tottenham Ladies, The Futsal Runners Up Hearts of Teddlothian and many more strong teams such as Enfield, Alexandra Park and our good friends Actonians. I was confident on the morning of the Festival. It would be two groups of teams and I hoped that the Clarets and Blues would be drawn in separate groups to give them both a chance of progressing, but it was only the winners of each group that would go through to the League Cup Final. To my huge relief, they got drawn apart. Now, I had the problem of going from a staggered kick off, which allowed me to coach both teams on match day, to both teams kicking off at the same time. Thankfully, help was on hand from some of our loyal parents. The Blues had Tottenham in their group and I could see the fear in some of the girls. We had a pep talk and I felt sure that the fears had been dispensed with and urged the girls to believe that they could beat any team. The Clarets had a tough group too, with some very strong teams in it, but with every chance of topping it….if they performed to their abilities. On the day, the Clarets made a hesitant start, but managed to win their first game and grew in confidence from there, with their greater experience telling and they won all games in their group. The Blues started well and won their opening matches. Then came Tottenham Ladies. I spoke with the girls again and assured them that they could do it. They went out confidently and played really well against a very good side. However, we weren’t turning possession into goals and I was silently praying we could get one. Then, out of nowhere, Tottenham burst forward and scored to make it 1 nil to them. Our girls looked down and, inside, I felt down, but knew this was not the time to give up. I encouraged the girls to push forward and try to pull one back. They worked their socks off and we scored to make it 1 a piece. At this stage, the Clarets had a break in their games and every Clarets player and parent were on the sidelines showing encouragement to the Blues. It was like as if the Clarets were also playing the game there was so much passion from them. There was only a minute or two left and we decided to go for the win and encouraged the girls to push forward. They listened and pushed constantly until they finally played it down the left wing cut inside and buried it in the bottom right hand corner. It was a moment to saviour and the Clarets and Blues celebrated as one. The Blues went on to win their remaining games, as did the Clarets, to ensure an all Ruislip Final. Whoever wins on Saturday, the U10 Girls will celebrate as one and will remain as one, ever since that glorious Saturday in March. Good luck to all the girls and remember to enjoy the moment!